In Greensboro, North Carolina, Rob Endling’s Bloodstone Studios has seen nationally signed recording artists to local musicians and everything in between. 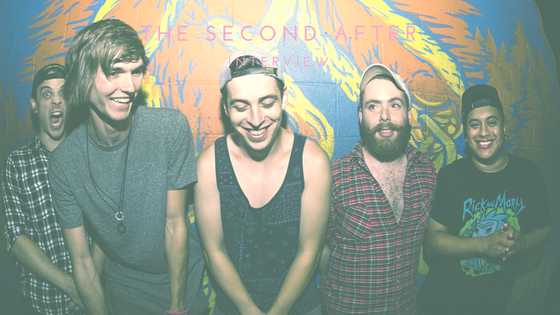 For pop-punk band The Second After, their time working with Endling resulted in an EP that is chock-full of positivity. Treadmills at the Finish Line took a little over two weeks to track. They were able to fully immerse themselves in the process by essentially living at the studio, working all day every day on each song. Each member’s creative influence is taken into account on each song, and this six-track EP was no exception. “Super Soaker Showdown”, “Craigslist Missed Connections” and “Slow Motion Roadrunner” all started as demos written by vocalist Michael Greason while “Homewreck Sick” and “Wish You Well” was written by guitarist Jeremiah Greason. The third track, “Before I Lose”, was originally released in 2017 and reworked into a full-band version specifically for this EP. Bassist Nolan Shambley, guitarist/vocalist Alfred Williamson and drummer Ryan McDonald equally played a part in the creative process and worked together with the Greasons to perfect their sound. The main theme they had going into the recording process was the Sasquatch album cover, believe it or not. To them he is a symbolic representation of their inner selves and they use him to represent the visual aspect of a person’s inner turmoil. The EP is meant to convey a sense of fun and positivity, and if someone listening to it can smile and head band along in order to get through a particularly bad day, then The Second After has completely succeeded in their mission.